Dream World Lapse: thick bass lines, and shiny bright arpeggios all stemming from inspiration found in a dream. Layered melodies come together to create a dark and euphoric progressive journey. Subweapon: A low end focused track with smooth pads coupled with classic 808 claps combine the epic past of progressive music with the modern sound of today. Deep energizing basslines build to a unique dance floor filler. 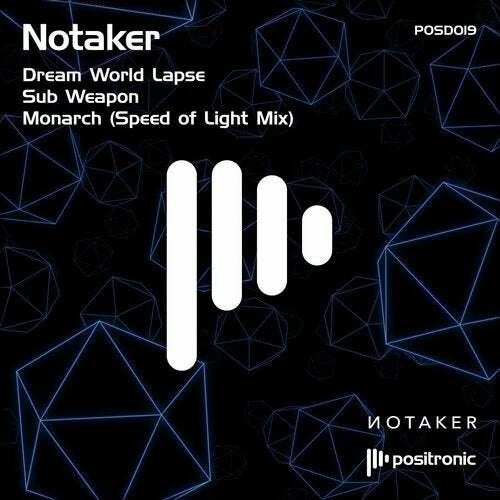 Monarch (Speed of Light Mix): A reimagined progressive track with a slower tempo and heavier vibe. Influenced by the monarch butterfly and loaded with creativity, the perfect end to a strong debut EP from Notaker.